High pressure will build into the region on Monday, resulting in sunny skies and dry weather that will last until Thursday. Temperatures will heat up as well, with 90s expected by Wednesday. Another stretch of dry, quiet weather is unfolding for the Finger Lakes, but this time with some heat. 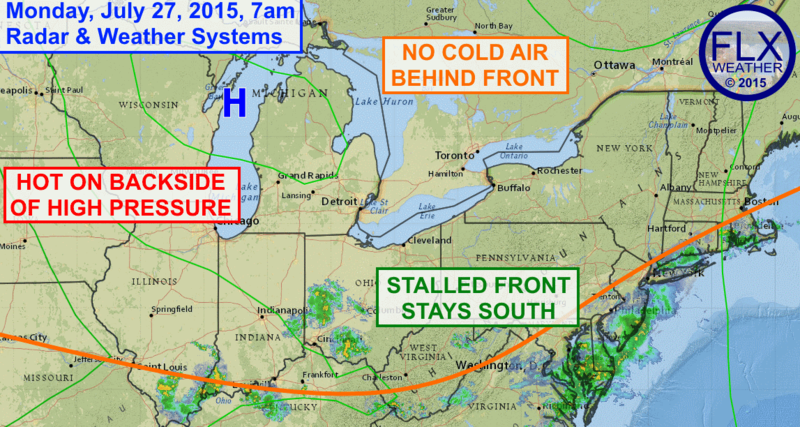 A front moved through the region Saturday night and has stalled out over coastal New England, the Mid Atlantic and back across the Ohio River Valley. 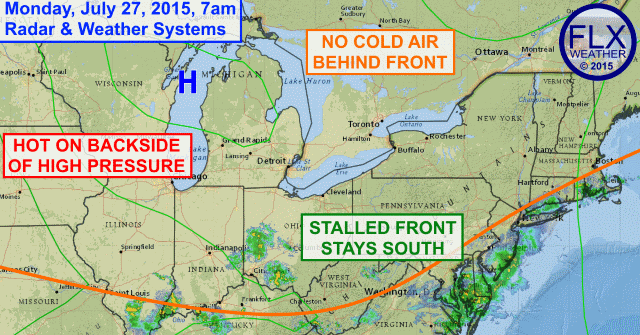 Meanwhile, a large, dominating area of high pressure is dropping southeast through the Great Lakes. This high pressure will keep a grip on our weather through Wednesday, even as the center of the high moves off the coast of the Southeast US. With a complete lack of cool air ahead of the high, temperatures will soar in southerly winds on the high’s back side. This will result in a few days of hot weather for the Finger Lakes, which should reach its height on Wednesday. Temperatures Monday and Tuesday should be in the mid and upper 80s, but many areas should eclipse 90º on Wednesday. Wednesday night, a cold front will come through with a few showers, returning temperatures to more normal levels for the remainder of the week.